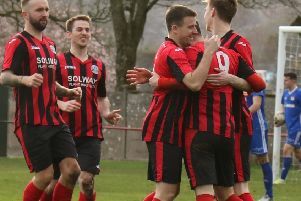 Dalbeattie Star picked up a crucial point in their quest to remain in the Lowland League and now stand nine points ahead of Whitehill Welfare, with the Rosewell side having just three games remaining. Star boss Darren Kerr picked the same line up that had performed so well in beating Kelty Hearts the week before, but this time around they were second best for most of the match. However, they showed another side to their character as they rolled their sleeves up and battled for the point they desperately needed. The students dominated as Star struggled to find any rhythm at all and in the fourth minute Eachainn Miller had a great chance but dragged his left foot shot wide. It was pretty much one way traffic as the home side became frustrated at their own lack of creativity but the one saving grace was the resolute defending that kept the scoresheet blank. Just before the half hour Rory MacEwan seemed sure to break the deadlock but Hugh Cameron came to the rescue with a superb block. Aiden Ferris Was next to miss the target from a good position for the students but four minutes from the break came the best chance of the half and surprisingly it fell to the Islecroft side. Lewis Sloan played a fine pass over the students defence to Scott Milligan who took a superb first touch to put himself clear, but as he attempted to lob Kevin Walker the keeper rushed from his line to block the effort and the ball went out for a corner. The visitors must have wondered how they weren’t ahead at the break and though they were still the better side in the second period, Parker had a much quieter second 45 minutes. With 20 minutes left Craig Brown hit the outside of the post with a 25 yard drive and ten minutes later Parker was at full stretch to turn MacEwan’s free kick wide for a corner. Spartans and BSC Glasgow visit Islecroft in the next week and a point in either match will confirm Star’s Lowland League status for another year.